I think it would be good to have some pictures of our minis, as opposed to the images from the minis. Here are a few pictures from a game I did today with my wife. We were testing out some rules for a new miniature game I am designing. I prefer to remove as much of the blank paper as possible. It takes a little time, and I have to be careful since the front and back doesn't always match perfectly, but I think the miniatures look a little better then. Agreed. I first did this for our Sundered Skies game, I'll do it for all my games in the future. 1) How long is this figure expected to be used? 2) Who am I using the figure with? Is the gamer going to not have a good time because he is constantly distracted by the amount of white around the figure? Seriously, I rarely cut back the white here. Most gamers here can handle the white border. The ones that cannot usually have other problems with the core of the group here so they do not come back on their own volition or more often, do not get invited back. After doing some experimentation, I decided it might be fun to customize some of my minis. I pray I am not offending the artist by messing with his work or by posting them here (If I am, I will happily cease and desist), but I thought that I'd share a couple of altered images. These look excellent! As far as i am concerned, tweak them to your hearts content. One of my own group is an inverterate doodler, and as soon as you hand him his paper miniature, he will draw on a different hat, add a cloak etc etc. Maybe not quite in the same league, but one of the reasons for releasing the ppt version is so that images can be copied into a graphics programme and altered (change cloak colours etc) and so that the text at the bottom can be altered. I'm new to Arion games, but like what I have purchased thus far. I primarily play table top miniature games, but don't have the time or funds to play all the periods I am interested in. With that in mind I purchased some Arion figure sets to make paper armies. 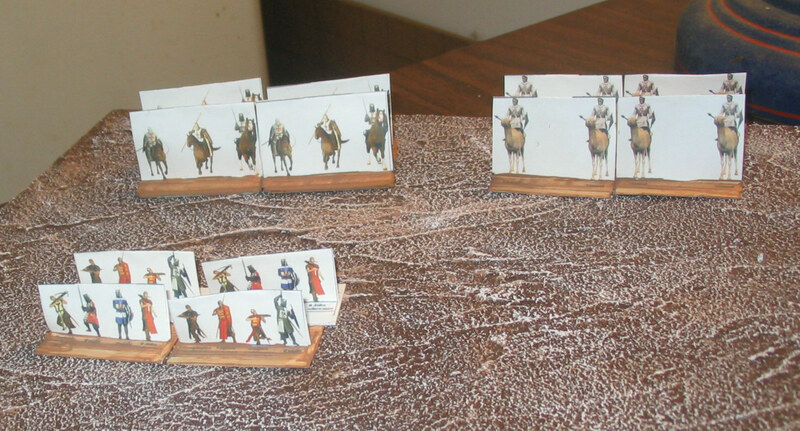 Here are some Crusaders scaled at 15mm and arranged into stands per the rules I am using. The process of grouping them was easy and pretty fun to do, so I am experimenting with making larger Fantasy armies too. Here are some pictures of my project prototypes. Welcome from a fellow affectionado of Graham's work. I like the unit bases you came up with. The bases are made from plastic "For Sale" signs you can pick up in grocery stores or hardware stores. They are roughly 20mm by 40mm, though the Cavalry are a bit wider. Having fun with these and will definitely get more. I did some "Roman Unit" figures for an issue of Targum a while ago along these lines. This is actually one of the reasons i supply a powerpoint version. It is an easy way to extract the base images. These can be used in homebrew handouts, character illustrations, unit figures, flat counters, online (Fantasy Grounds etc) tokens etc.